C.H. (Cathie) Armstrong is 1992 graduate of the University of Oklahoma and is the author of THE EDGE OF NOWHERE (Penner, 2016), ROAM (Central Avenue, Feb. 5, 2019) and co-author of DÉJÀ YOU: STORIES OF SECOND CHANCES. She is represented by Tina P. Schwartz at The Purcell Agency, LLC. A day late and a dollar short, but this is my HUGE thank you to everyone who was so kind to help support and promote the release day for ROAM! From the bottom of my heart, THANK YOU! 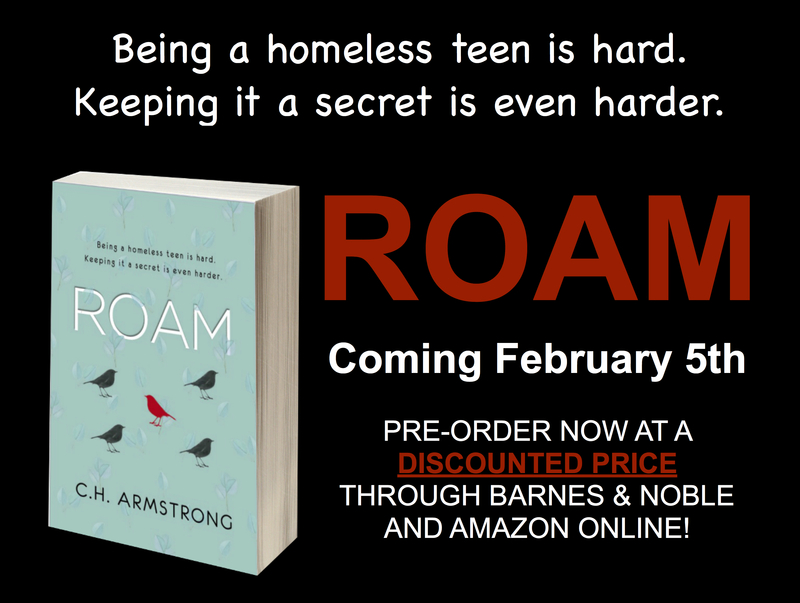 Continue reading HAPPY BOOK BIRTHDAY TO ROAM! Purchase your copy of ROAM and Win a Prize Pack! Continue reading Purchase your copy of ROAM and Win a Prize Pack! Wishing a Happy Book Birthday to Kara McDowell on her debut young adult novel, JUST FOR CLICKS! Congratulations to Nicole Anderson! She's my latest winner for a FREE ARC of ROAM! Keep an eye on my social media for your chance to win! Continue reading Honoring Black Authors on MKL Jr. Day! Continue reading ROAM: COMING FEB 5–READ THE ENTIRE FIRST CHAPTER FREE!